How about some brand new prints? First up, let's head over to Swoon Gallery where I've got more limited edition hand doodled prints. "King Crab" and "Queen Bee" have a bevy of royal pals that they wanted to show off. Each print is signed, numbered (limited to 10 each) and has a unique character on the bottom (dancing bears, jelly fish with crowns, bee hives and starfish to name a few). They are $50 each and available by emailing Ally at hello@swoongallery.com She also still has a few of my other doodled prints left - email her for what's available. Now let's go over to Gallery Nucleus where you can find "Saturnine" prints. These are 8.5 x 11 and $25 each. They are also the only place to find "Good Rocky's Revival" prints, "Mr. McPrickles" and "Daffadown Dilly". Lots and lots of wonderful artwork available here - definitely worth browsing for something special. 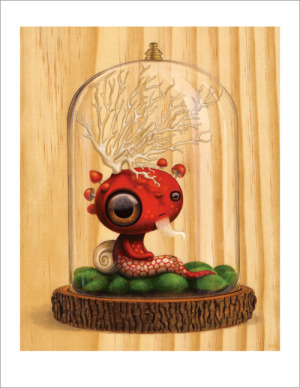 Finally on to my own shop where I've got two brand new print releases -- "Noodles" and "Luna Ascensio Rex". Both are 8" x 10" including a white border so they are ready to frame and hang. As with all my prints, they are titled, signed, dated and printed on thick, smooth velvet fine art paper from Hahnemuhle. And as a small token of my appreciation for all my amazing fans, if you enter the code HOLIDAY2012 you'll get 10% off of your entire order! Good through Sunday, November 25th at midnight. Have fun shopping and thank you!